Let's face it: the thought of yet another slog through gridlock can leave you pining to do anything else. Fortunately, traffic experts are using science, technology and some surprisingly simply measures to reduce our driving woes-from speed bumps to forward-collision alert systems. Here is a glimpse into some innovations designed to keep traffic flowing and drivers from losing their cool. Forget old-fashioned traffic circles. Modern "roundabouts," developed by the UK's Transport Research Laboratory, are far smaller, requiring drivers to slow down to enter their sharp circular turns. "Studies show that roundabouts not only reduce crashes but also reduce traffic delays and fuel use," says Russ Rader of the Insurance Institute for Highway Safety (IIHS). Since the 1990s, roundabouts have been introduced in many northeastern and mid-Atlantic states, and more states are planning to add them. Drivers may curse them, but red-light cameras work: the devices photograph or film the license plate of any vehicle running a red light, then a ticket is mailed to the registered owner. A 2011 IIHS study found that large cities with red-light cameras had 17 percent fewer fatal crashes at signalized intersections and 24 percent fewer deaths from running red lights than cities without them. "If crashes are prevented," says Rader, "then the traffic jams and congestion that result from them are prevented as well." Unlike conventional traffic signals, which use programmed timing schedules to activate their green, yellow and red lights, adaptive traffic signals process data from strategically placed sensors to adjust to changing traffic patterns (i.e., no more waiting at a red light when all the other lanes are empty). The Federal Highway Administration says adaptive signals typically improve travel time by more than 10 percent. With GPS-guided navigation systems increasingly common in cars and all but ubiquitous in smartphones, you can now get real-time traffic data on the go. In most cases, real-time navigation can automatically reroute you around a traffic snarl. Many current systems only cover major freeways, but that's quickly changing. 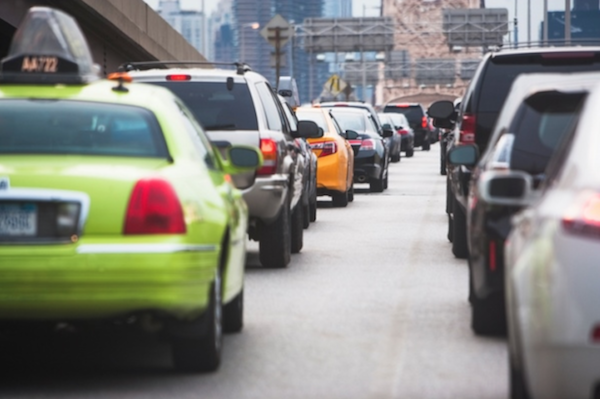 A variety of mobile apps (such as Waze) are now capable of gathering GPS data from participating drivers' phones, analyzing it and instantly returning updated traffic reports for all roads. Hey, if you can't eradicate traffic, at least you can try to escape it. Learn techniques to manage stress and stay safer behind the wheel with our tips on Defensive Driving in Heavy Traffic. Speaking of cool apps, have you downloaded GEICO Mobile yet? You can access Emergency Roadside Service, pay your bill, update your policy and more, right on your smartphone. Download it now in the App Store or Google Play.